Jane Lindholm does double duty as host of Vermont Public Radio's "Vermont Edition" and "But Why? ", a science podcast for kids. One afternoon in mid-July, Jane Lindholm settled into her host’s chair for another installment of Vermont Edition, Vermont Public Radio’s noontime call-in show. But instead of starting the hour with statewide news and issues, a twangy tune began to play. Lindholm’s second gig at the station is hosting But Why?, a podcast that answers questions sent by curious kids. For the next hour, she fielded questions about the Big Bang, black holes and beyond with a local astronomy professor. Meanwhile, But Why? co-producer Melody Bodette juggled over 100 prerecorded questions, as well as callers from all over the country and commenters on Facebook Live. The feedback from regular Vermont Edition listeners was overwhelmingly positive. Apparently, even the curmudgeonliest of Vermonters couldn’t help but be charmed by kids’ curiosity. It’s rare to tune into a public radio station and hear programming aimed at children. That’s in stark contrast to public television’s approach to the public media mandate. While PBS has built a reputation on educational kids’ programming, public radio has come to focus on news and culture aimed squarely at adults. A growing slate of public radio–affiliated kids’ podcasts like But Why? are opening the gates for creative experimentation on air. But the road to the equivalent of “NPR Kids” includes a few obstacles. One challenge is that kids’ shows on public radio have had a spotty track record, with only a few attempts to create nationwide shows. Among the best-known was Kids America, produced by WNYC from 1984 to 1987. Fondly remembered by many now-grown kid listeners, the two-and-a-half–hour variety show aired in only 26 markets. It won a Peabody Award but proved unsustainable. Local kids’ shows have run into similar problems. Vermont Public Radio, now home of But Why?, aired a children’s show titled Camel’s Hump Radio in the early 2000s. Franny Bastian, VPR’s director of programming, cited cost, difficulty obtaining rights to content, and a lack of listenership as reasons for its cancellation. “There have been individual success stories,” says O’Connell, who started a local kids show on Philadelphia’s WXPN immediately after Kids America was canceled. That show, Kids Corner, celebrates 30 years on air this year and averages about 2,000 calls per month. “It’s basically been a very bare-bones operation that has been able to be successful because of community support and the support of the radio station,” O’Connell says. That kind of support is the exception rather than the rule. It may also explain why many of public radio’s most successful kids’ podcasts were launched as side projects by ambitious producers. John Sheehan produced the first season of Eleanor Amplified, a scripted radio drama from Philadelphia’s WHYY, while he was working for Fresh Air. He’s now director of podcasts at WHYY, a job that includes making Eleanor Amplified. Radio stations are slowly being won over to the idea of airing more kids’ audio content, but there are still barriers. Sheehan says WHYY has explored the idea. “The challenges are mainly structural,” says Sheehan. They include reformatting the show for a broadcast clock, assigning someone to the job and sustaining a weekly show. “[B]ut there’s also the concern from a programming standpoint, namely, would our audience freak out if we aired a kids’ show on a Saturday morning?” he says. But Brains On! has experimented with radio since its launch in 2012. Minnesota Public Radio’s local All Things Considered broadcast airs biweekly Brains On! segments. That came about because the show’s founders were working in MPR’s newsroom when they started the show. “We’d ask, ‘Hey, do you want to play a bit of this on your show?” says Bloom. Now that the team works on making kids’ podcasts full-time, they’ve produced two hourlong Brains On! Specials for radio distribution alongside other APM podcasts such as Terrible, Thanks for Asking. But Bloom emphasizes that podcasts and radio aren’t interchangeable. A total of 139 stations have carried the two Brains On! radio hours. “We’ve been pleased with the carriage of our specials so far,” says Lauren Dee, manager of podcasts for APM. A community radio station in Montana is also airing regular episodes of the podcast as part of a children’s radio hour. “It’s an experiment we are watching with interest,” Dee says. Kids’ podcasts already reach a wide audience, but radio could help them reach thousands more listeners. According to Edison Research, over half of Americans have never listened to a podcast. The long-standing success of PBS’ children’s programs makes a strong case for the benefits of free access to high-quality educational programming. There’s no question as to whether there is great content available and an eager audience for kids’ programming. The question is whether stations are open to experimentation on their airwaves as well as in earbuds. Child-privacy laws prohibit surveying listeners under 12, but with Edison Research, APM found that the adult audience for Brains On! is more evenly distributed across income brackets than public radio’s audience. Brains On! listeners are also younger and skew more female. In other words, they’re probably moms. “So while it may be a challenge for public radio broadcasters to get these listeners’ ears to tune in initially, the benefit is that kids and families [are] bringing in new and younger listeners,” says Dee. Such findings are backed up by WXPN’s O’Connell. She said she consistently hears that listeners who tune into Kids Corner during the week continue to tune into WXPN’s weekend music programming during the same time slot. 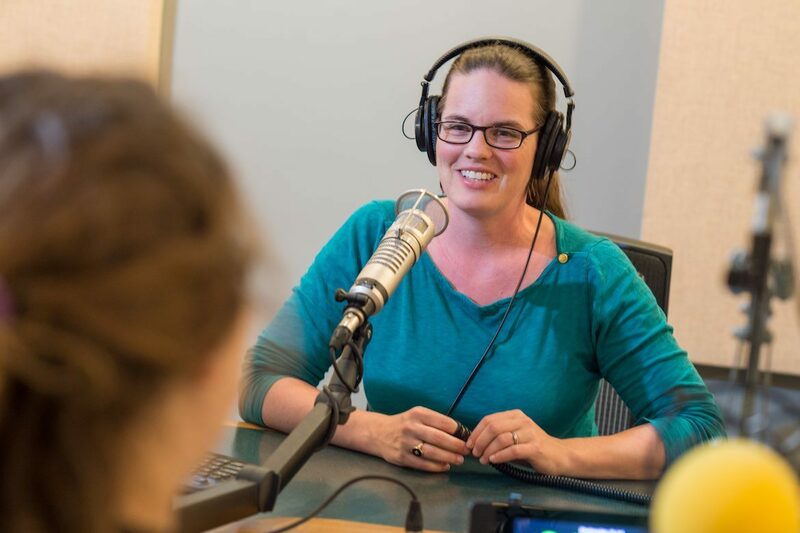 Just as Mister Rogers’ Neighborhood and Sesame Street raised a generation of loyal public television viewers, public radio has the opportunity to plant the seeds for its next generation of listeners. With enough creativity, “NPR Kids” might not be too wild an idea to work. Lindsay Patterson is the creator, producer and co-host of Tumble, a science podcast for kids. She is also a co-founder of Kids Listen, a grassroots organization of advocates for high-quality audio content for children. I was working at WXPN when Kids America got cancelled. Our General Manager Mark Fuerst (who wasn’t even a parent yet) recognized the unique talents of Kathy O’Connell and the importance of maintaining a safe radio space for children, so he called Kathy and convinced her to leave NY and launch a new program in Philadelphia. That program has survived because of Kathy’s amazing ability to listen to and connect with kids (her inner child is very much alive) not to mention the devotion and hard work from Robert Drake, her tireless sidekick and producer. I haven’t worked at or around WXPN in 25 years, but I can still hear that Kids Corner theme song in my head, I can still remember kids performing on air; answering the phones as kids called in to vote for the #1 song; kids calling in to talk to scientists, psychologists, teachers, musicians and so many other adults who spread knowledge and joy. I often wondered why more University-based stations didn’t prioritize kids programming as a unique service to their communities. Kids Corner has certainly helped boost the University of Pennsylvania’s reputation as a local community leader, probably much more than AAA music ever will. (This coming from a fan of AAA). I have absolutely no idea if the program is as wildly popular in the YouTube and podcasting era as it once was, whether Kathy still gets invited to schools and to emcee concerts and other events for kids. I would be very (pleasantly) surprised if WXPN continued with Kids Corner if and when Kathy retires. Surely, she is irreplaceable, but I’m also sure there are many other talents out there who would covet the opportunity. We shall see.